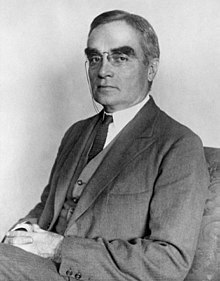 Billings Learned Hand (27 January 1872 – 18 August 1961), usually called simply Learned Hand, was an American judge famous as an avid supporter of free speech and for applying economic reasoning to American tort law. He is noted as one of the most influential American judges to have never served on the Supreme Court of the United States. Life is not a thing of knowing only — nay, mere knowledge has properly no place at all save as it becomes the handmaiden of feeling and emotion. A wise man once said, "Convention is like the shell to the chick, a protection till he is strong enough to break it through." We like rather to dream of a body of young men as a live thing, as a tree where all the branches are nourished by a single sap, and where each part is meaningless and incomplete except in connection with its fellows. You may lop away the dead branches, you may bend the trunk, you may dig about it and water it; but leave it to assume its own form, do not constrain the peculiar roots, or you will have a crippled, gnarled monster, and no tree. It is of course true that any kind of judicial legislation is objectionable on the score of the limited interests which a Court can represent, yet there are wrongs which in fact legislatures cannot be brought to take an interest in, at least not until the Courts have acted. Letter to Louis D. Brandeis, dated (22 January 1919). Yet the whole structure of the common law is an obvious denial of this theory; it stands as a monument slowly raised, like a coral reef, from the minute accretions of past individuals, of whom each built upon the relics which his predecessors left, and in his turn left a foundation upon which his successors might work. Book Review, 35 Harv. L. Rev. 479, 479 (1922) (reviewing Benjamin N. Cardozo's The Nature of the Judicial Process). The law, being an inherited accumulation, imposes itself on each generation willy-nilly. Any society whose members enter and leave it severally must for very convenience, to say nothing of deeper reasons, proceed by tradition; the neophyte must adopt existing habits and ways of acting, if for no better reason, through inexperience and diffidence. Mere custom will do the rest as he proceeds. And so the rule is canonized, its origins, and therefore its meaning, are ignored. But genuine learning is quite different. "Mr. Justice Holmes at Eighty-Five" (1926). "In Memory of Charles Neave" (1938). Like John Stuart Mill, he would often begin by stating the other side better than its advocate had stated it himself. On Benjamin N. Cardozo in "Mr. Justice Cardozo" (1939); also in The Spirit of Liberty: Papers and Addresses (1952), p. 131. "On Receiving an Honorary Degree" (1939). You may ask what then will become of the fundamental principles of equity and fair play which our constitutions enshrine; and whether I seriously believe that unsupported they will serve merely as counsels of moderation. I do not think that anyone can say what will be left of those principles; I do not know whether they will serve only as counsels; but this much I think I do know — that a society so riven that the spirit of moderation is gone, no court can save; that a society where that spirit flourishes, no court need save; that in a society which evades its responsibility by thrusting upon the courts the nurture of that spirit, that spirit in the end will perish. What is the spirit of moderation? It is the temper which does not press a partisan advantage to its bitter end, which can understand and will respect the other side, which feels a unity between all citizens—real and not the factitious product of propaganda—which recognizes their common fate and their common aspirations—in a word, which has faith in the sacredness of the individual. "The Contribution of an Independent Judiciary to Civilization" (1942). The day has clearly gone forever of societies small enough for their members to have personal acquaintance with one another, and to find their station through the appraisal of those who have first hand knowledge of them. Publicity is an evil substitute and the art of publicity is a black art; but it has come to stay, every year adds to its potency and to the finality of its judgments. The hand that rules the press, the radio, the screen and the far-spread magazine, rules the country whether we like it or not, we must learn to accept it. "Proceedings in Memory of Justice Brandeis" (1942). What do we mean when we say that first of all we seek liberty? I often wonder whether we do not rest our hopes too much upon constitutions, upon laws and upon courts. These are false hopes; believe me, these are false hopes. Liberty lies in the hearts of men and women; when it dies there, no constitution, no law, no court can save it; no constitution, no law, no court can even do much to help it… What is this liberty that must lie in the hearts of men and women? It is not the ruthless, the unbridled will; it is not the freedom to do as one likes. That is the denial of liberty and leads straight to its overthrow. A society in which men recognize no check on their freedom soon becomes a society where freedom is the possession of only a savage few — as we have learned to our sorrow. “The Spirit of Liberty” - speech at “I Am an American Day” ceremony, Central Park, New York City (21 May 1944). "A Pledge of Allegiance" - speech for "I Am an American Day" in Central Park, New York, New York. (20 May 1945). We may not stop until we have done our part to fashion a world in which there shall be some share of fellowship; which shall be better than a den of thieves. Let us not disguise the difficulties; and, above all, let us not content ourselves with nobel aspirations, counsels of perfection, and self-righteous advice to others. We shall need the wisdom of the serpent; we shall have to be content with short steps; we shall be obliged to give and take; we shall face the strongest passions of mankind — our own not the least; and in the end we shall have fabricated an imperfect instrument. But we shall not wholly have failed; we shall have gone forward, if we bring to our task a pure and chastened spirit, patience, understanding, sympathy, forbearance, generosity, fortitude, and, above all, an inflexible determination. The history of man has just begun; in the aeons which lie before him lie limitless hope or limitless despair. The choice is his; the present choice is ours. It is worth the trial. "A Pledge of Allegiance" - speech for "I Am an American Day" Central Park, New York, New York. (20 May 1945) Hand credited H. G. Wells with inspiring some of the ideas expressed in this speech. Justice, I think, is the tolerable accomodation of the conflicting interests of society, and I don't believe there is any royal road to attain such accomodations concretely. From The Great Judge by Philip Hamburger (1946). "I beseech ye in the bowels of Christ, think that ye may be mistaken." I should like to have that written over the portals of every church, every school, and every courthouse, and, may I say, of every legislative body in the United States. I should like to have every court begin, "I beseech ye in the bowels of Christ, think that we may be mistaken." Morals in Public Life (1951); Hand is here paraphrasing a famous expression of Oliver Cromwell from his letter of 3 August 1650 to the general assembly of the Church of Scotland. If we are to keep our democracy, there must be one commandment: Thou shalt not ration justice. To The New York Legal Aid Society (16 February 1951). Speech in New York, New York (27 January 1952). * The mid-day sun is too much for most eyes; one is dazzled even with its reflection. Be careful that too broad and high an aim does not paralyze your effort and clog your springs of action. The Spirit of Liberty: Papers and Addresses (1952), p. 9. "The Preservation of Personality" commencement address at Bryn Mawr College, Bryn Mawr, Pennsylvania (2 June 1927); also in The Spirit of Liberty: Papers and Addresses (1952), p. 32. Our dangers, as it seems to me, are not from the outrageous but from the conforming; not from those who rarely and under the lurid glare of obloquy upset our moral complaisance, or shock us with unaccustomed conduct, but from those, the mass of us, who take their virtues and their tastes, like their shirts and their furniture, from the limited patterns which the market offers. "The Preservation of Personality" (2 June 1927). We believe, and I think properly, that when the men who met in 1787 to make our Constitution they made the best political document ever made; but, remember, they did so very largely because they were great compromisers. Testimony before the United States Congress, Senate Committee on Labor and Public Welfare, hearing on the Establishment of a Commission on Ethics in Government (1951). No doubt one may quote history to support any cause, as the devil quotes scripture; but modern history is not a very satisfactory side-arm in political polemics; it grows less and less so. "Sources of Tolerance" (1930); also in The Spirit of Liberty: Papers and Addresses (1952), p. 79. The condition of our survival in any but the meagerest existence is our willingness to accommodate ourselves to the conflicting interests of others, to learn to live in a social world. Address to Yale Law Graduates (1931); also in The Spirit of Liberty: Papers and Addresses (1952), p. 87. "Democracy: Its Presumptions and Realities" (1932); also in The Spirit of Liberty: Papers and Addresses (1952), p. 92. When I hear so much impatient and irritable complaint, so much readiness to replace what we have by guardians for us all, those supermen, evoked somewhere from the clouds, whom none have seen and none are ready to name, I lapse into a dream, as it were. I see children playing on the grass; their voices are shrill and discordant as children's are; they are restive and quarrelsome; they cannot agree to any common plan; their play annoys them; it goes poorly. And one says, let us make Jack the master; Jack knows all about it; Jack will tell us what each is to do and we shall all agree. But Jack is like all the rest; Helen is discontented with her part and Henry with his, and soon they fall again into their old state. No, the children must learn to play by themselves; there is no Jack the master. And in the end slowly and with infinite disappointment they do learn a little; they learn to forbear, to reckon with another, accept a little where they wanted much, to live and let live, to yield when they must yield; perhaps, we may hope, not to take all they can. But the condition is that they shall be willing at least to listen to one another, to get the habit of pooling their wishes. Somehow or other they must do this, if the play is to go on; maybe it will not, but there is no Jack, in or out of the box, who can come to straighten the game. "Democracy: Its Presumptions and Realities" (1932); also in The Spirit of Liberty: Papers and Addresses (1952), p. 99 - 100. "A Fanfare for Prometheus" (29 January 1955); also in The Spirit of Liberty: Papers and Addresses (1952), p. 131. It is still in the lap of the gods whether a society can succeed which is based on "civil liberties and human rights" conceived as I have tried to describe them; but of one thing at least we may be sure: the alternatives that have so far appeared have been immeasurably worse. "A Fanfare for Prometheus" (29 January 1955). Granting court permission for Samuel Goldfish to change his name to Samuel Goldwyn, as quoted in Lion's Share by Bosley Crowther (1957). The Bill Of Rights (1958), p. 72. The Bill of Rights (1958), p. 73. Oliver Wendell Holmes lecture delivered at Harvard (1958); quoted in The Rhetoric of Our Times (1969) by J. Jeffery Auer, p. 124. The judge's authority depends upon the assumption that he speaks with the mouth of others. That is to say, the momentum of his utterances must be greater than any which his personal reputation and character can command, if it is to do the work assigned to it — if it is to stand against the passionate resentments arising out of the interests he must frustrate — for while a judge must discover some composition with the dominant trends of his times, he must preserve his authority by cloaking himself in the majesty of an overshadowing past. As quoted by William J Brennan Jr, Associate Justice, US Supreme Court, NY Times (October 6, 1963); and later in "The Role of the Court — The Challenge of the Future" in An Affair with Freedom (1967). As quoted in The Modern Researcher, 3rd edition (1977) by Jacques Barzun and Henry Graff, p. 44. The public needs the equivalent of Chevrolets as well as Cadillacs. On the trends toward popular marketing of legal services, quoted in USA Today (2 February 1984). This is the most miserable of cases, but we must dispose of it as though it had been presented by actual lawyers. As quoted in Learned Hand : The Man and the Judge (1994) by Gerald Gunther. I had rather take my chance that some traitors will escape detection than spread abroad a spirit of general suspicion and distrust, which accepts rumor and gossip in place of undismayed and unintimidated inquiry. That community is already in the process of dissolution where each man begins to eye his neighbor as a possible enemy, where nonconformity with the accepted creed, political as well as religious, is a mark of disaffection; where denunciation, without specification or backing, takes the place of evidence; where orthodoxy chokes freedom of dissent; where faith in the eventual supremacy of reason has become so timid that we dare not enter our convictions in the open lists, to win or lose. The mutual confidence on which all else depends can be maintained only by an open mind and a brave reliance upon free discussion. How long shall we blunder along without the aid of unpartisan and authoritative scientific assistance in the administration of justice, no one knows; but all fair persons not conventionalized by provincial legal habits of mind ought, I should think, unite to effect some change. Parke, Davis & Co. v. H. K. Mulford Co. (1911). Political agitation, by the passions it arouses or the convictions it engenders, may in fact stimulate men to the violation of the law. Detestation of existing policies is easily transformed into forcible resistance of the authority which puts them in execution, and it would be folly to disregard the causal relation between the two. Yet to assimilate agitation, legitimate as such, with direct incitement to violent resistance, is to disregard the tolerance of all methods of political agitation which in normal times is a safeguard of free government. Masses Publishing Co. v. Patten (1917). [W]hat seems fair enough against a squalid huckster of bad liquor may take on a different face, if used by a government determined to suppress political opposition under the guise of sedition. U.S. v. Kirschenblatt, 16 F.2d 202, 203 (2d Cir. 1926). Any one may so arrange his affairs that his taxes shall be as low as possible; he is not bound to choose that pattern which will best pay the Treasury; there is not even a patriotic duty to increase one's taxes. Helvering v. Gregory, 69 F.2d 809, 810-11 (2d Cir. 1934). National Labor Relations Board v. Federbush Co., 121 F.2d 954, 957 (1941). There is no surer way to misread any document than to read it literally. … As nearly as we can, we must put ourselves in the place of those who uttered the words, and try to divine how they would have dealt with the unforeseen situation; and, although their words are by far the most decisive evidence of what they would have done, they are by no means final. United States v. Di Re (1947). Over and over again courts have said that there is nothing sinister in so arranging one's affairs as to keep taxes as low as possible. Everybody does so, rich or poor; and all do right, for nobody owes any public duty to pay more than the law demands: taxes are enforced exactions, not voluntary contributions. To demand more in the name of morals is mere cant. Commissioner v. Newman, 159 F2d 848 (1947). This page was last edited on 27 December 2018, at 18:02.